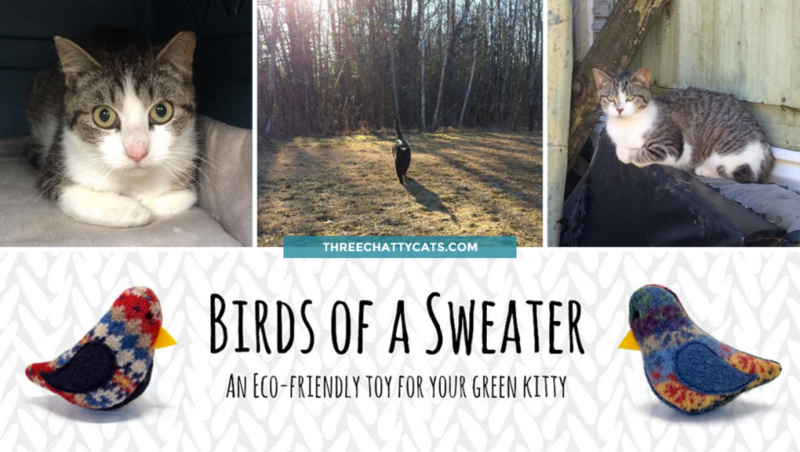 When I started following Becky and her Birds of a Sweater profile on Instagram, I thought her TNR efforts and handmade cat toys would make for an interesting interview. 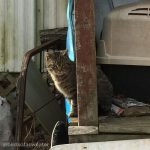 Becky holds monthly giveaways on her Instagram profile for her cat toys, and I wanted to hold a giveaway today here on the blog as well to support her feral colony. How did you start caring for the colony? In January of last year, I purchased the 18 acres of land adjoining my parents’ farm, hoping to eventually, at the end of our land contract, move there and start my own small hobby farm. The land is a hoarder property, with many run-down buildings, abandoned trailers, cars, tractors, and other garbage. The former owner didn’t fix any of her cats, and at that time there were about 30 of them, all feral except for a few. By the time I took over the feeding and care of the colony (when the former owner moved away and left them), there were about 20 left, all starving and sick. Does anyone else help you care for the cats? My daughter, Calli, is 11 and does 50% of the work! 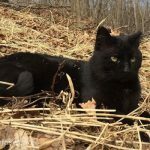 How do you care for the cats? We care for the colony daily, feeding and watering the cats. We’ve treated the entire colony for a horrible upper respiratory infection, and we monitor their health daily. We’re in the middle of TNR, we have about half of the colony done and hope to have the rest done soon. We’ve fostered a few of the sick kittens that we pulled from the colony and have adopted one out. 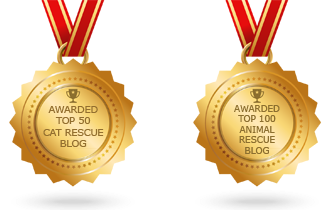 Do you have shelters or rescues that you work with? 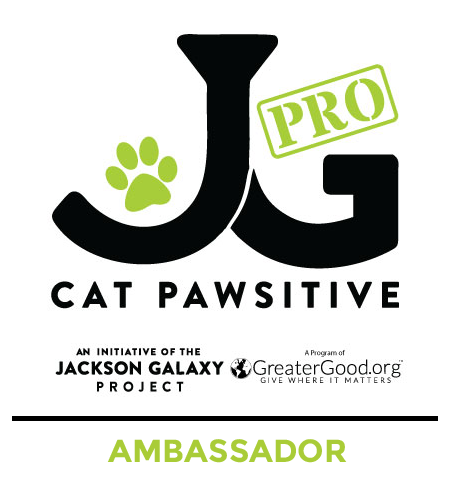 We don’t work with anyone in our area besides our vet, but we love partnering with TNR organizations around the country to help them network and get the funds needed to continue their mission. What is the best part about helping the colony? Releasing a TNR’d cat, knowing how much better their life will be, is definitely one of the best parts. Or the first time I saw them play, many months after we’d been feeding them – I knew then that they were finally healthy and happy. 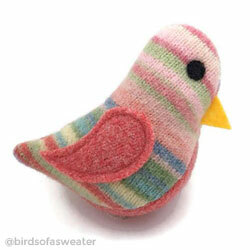 Most of the feeding and medical expenses are covered by the sales of the Birds of a Sweater cat toys that I make. We’ve also been blessed by the Instagram community and have received numerous donations of food from our Amazon Wish List, as well as direct donations to our GoFundMe account. Oh, it’s definitely Officer Tom! 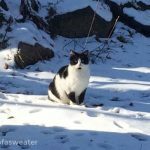 It was bitterly cold on December 23rd when we were feeding, and a new cat was at the feeding station. He was an unaltered, large, adult male cat, and he was friendly! 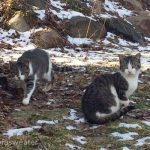 That was a big change because the cats in our colony are truly feral – with the exception of one, we can’t get near them. Because we’re so rural, we believe he was dumped. Calli named him Officer Tom and he quickly became the alpha male of the colony. 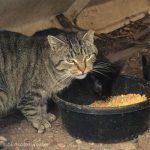 Officer Tom was TNR’d in February. Since then he just continues to amaze us – originally meeting us on the path to the colony and escorting us around as we fed, watered, and trapped, and now also visiting part time on my parents’ farm and getting snuggles whenever possible. He won’t allow us to bring him inside, but we’re hoping to at least convince him to sleep in our barn before next winter. He’s a wonderful companion and we love him so much. Toffee in her carrier, on her way to visit the vet. 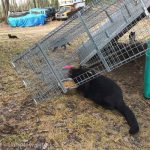 Officer Tom shows the other cats how to eat under the drop trap. Have you adopted any of the cats from the colony? Yes, the first sick kitten we pulled from the colony, Buddy. He was about 5-6 months old when we caught him with a nasty upper respiratory infection and brought him in to treat. He has turned into the sweetest cat. Milly is our oldest cat at 5 years old. She was found as a stray in my sister’s garage when she was just 6 weeks old. Doom, our other adult cat, is also 5. He was a stray that walked in our front door when we lived in Chicago and adopted us! Mr. Smith is our Goldendoodle – he is also 5. He LOVES all cats and wishes they would play with him more. Our barn cats, Robin and Lark, came to us from a farm down the road. They will both be turning one next month. We’re also currently fostering Leo, our neuro kitty, who was pulled from the colony a few months ago. Some sort of trauma left him with a permanent head tilt, muscle damage resulting in buggy eyes, light cataracts, and poor reflexes in his back legs. He is about 10 months old, and honestly, will probably be a foster fail. Foster cat Leo (left) with adopted colony cat Buddy (right). How did Birds of a Sweater get started? In 2009, my sister and I started our Etsy shop, then called “Three Sassy Sisters”. She sold handmade pet collars and I sold needle felted cat toys. In 2010, I added the Birds of a Sweater toys to the shop, after playing around with the idea for a while and letting my own cat, Jack, test them. Eventually, my sister moved across the country and we closed the shop. I reopened it in 2015 after moving to Wisconsin. In 2016, I changed the name to Birds of a Sweater when I realized that I was going to need to support the feral cat colony. As we come to the end of our TNR efforts with this colony, I’m beginning to allocate part of the proceeds to different TNR organizations. As of now, $2 from the proceeds of each “bird of the month” is donated. I’m hoping to be able to do more in the near future. 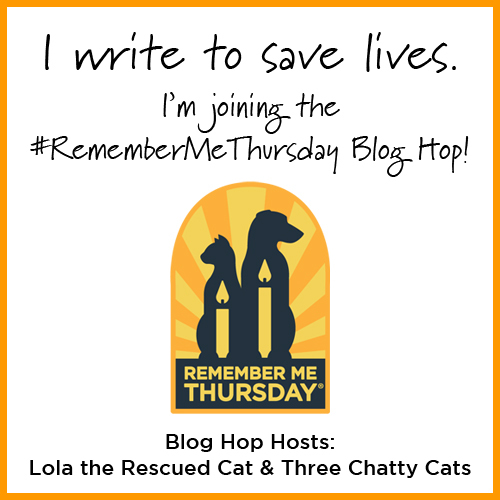 Do you have a “9 to 5” job or is rescuing cats what you do full time? Sometimes it feels like I rescue full time! My full-time business that supports our family is thesodapopshop.net, we sell on the website as well as Ebay and Etsy. Between that and the Birds of a Sweater, I stay very busy! I used to be the Senior Wildlife Specialist and Executive Director of a wildlife rehabilitation center in Illinois for about 8 years. We rehabilitated thousands of sick, injured, and orphaned wild animals every year. I’m also a US Air Force veteran! Rachel here! 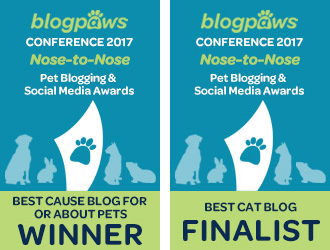 I will be purchasing a 3-pack of toys from birdsofasweater.com and one lucky reader will win the set of handmade cat toys! Leave a blog comment below and then enter the giveaway. Also, hop on over to Becky’s Etsy shop to show your support. Sales of her cat toys go to supporting her feral cat colony. And, $2 from the proceeds of each “bird of the month” is donated to a different group each month that is helping cats. The current bird of the month is April Stripes, pictured here. The giveaway is open to U.S. residents who reside in the 48 contiguous states, 18+ years of age, except where prohibited by law. One winner will be selected randomly by Rafflecopter and contacted via email. The winner will have 48 hours to claim their prize. Failure to do so will result in forfeiture of the prize, and a new winner will be randomly selected by Rafflecopter. The giveaway closes on Wednesday, April 19, 2017 at noon Pacific. This is not a sponsored giveaway. 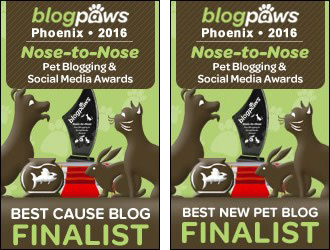 A big thank you to Becky for the interview and everything she does for her colony of cats! And, for donating to other TNR groups as well! If you’d like to connect with Becky, please follow her Birds of a Sweater Instagram profile, where you can also find a link to her Amazon Wish List and her GoFundMe page. Birds of a Sweater is also on Facebook. Great interview! Mom use to take care of the feral kitties at her work. Very cute birdies! Birds of a Sweater is one of my favorite stops on IG and have enjoyed following the story of Officer Tom! Enjoyed this interview because I didn’t know the background to the story! Thank you and Keep up the great work! What great cat toys! I plan on orderingsome very soon! Congratulations to Becky for her awesome work and also for her birds. They are so cute! Big paws up to Becky and her daughter for all they are doing to take care of the colony! 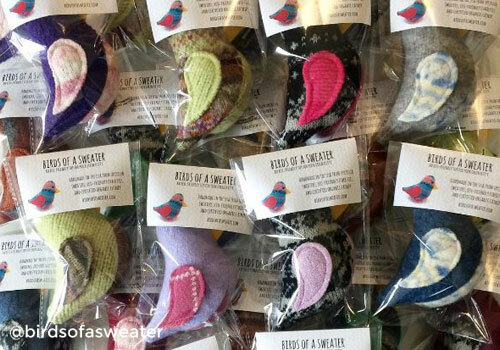 We’re loving those Birds of a Sweater toys. So cute! Those are such cute toys. What a wonderful gal Becky is to take in and help all those kitties. Thanks for having this giveaway. Have a great day. Becky is a true Angel to do all she is doing, as is her daughter. Becky’s background certainly paved the way for what she is doing now! Her toys are darling, I never see enough cat toys that are birds and cats just love them! Hers are colorful and darling! I’m glad Becky and her daughter are able to care for this feral colony. That was a good interview. Bless you Becky! We can so rlate to that, except for the super harsh winter. What a kind lady that Becky & her little girl, too! I predict chat noir Tom will be inching his way inside her home before long and good for him! Mighty neat birdie toys! Mew Mew! I love reading about people who actually execute the changes they wish to see vs. just talking about what should be done. Job well done! 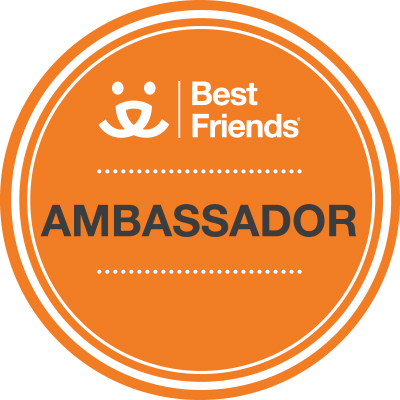 You’ve got quite a beautiful clowder there … and you’re truly making a difference. The burds aare so cute and she does such important work with the colony. I’m gonna bookmark the site for Secret Paws. What a great cause ! 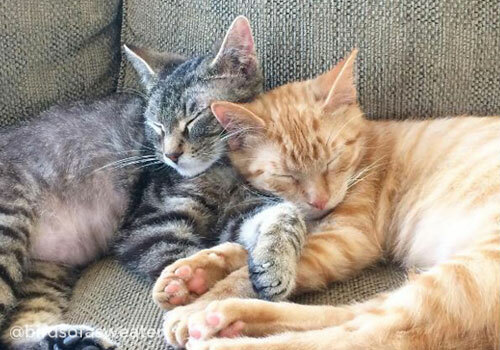 Paws up for Becky & her daughter and everyone who helps her save these cats. Paws up to Becky for all she does for the feral cats. Those birds are great! This is so fantastic!!! Becky sounds like an amazing lady and those toys are just too cute! Thank you so much for introducing us to her and the fun giveaway! Becky and her daughter sound like amazing people. These little birds are so cute… stylish cat toys! 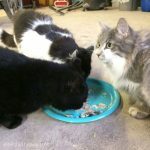 I am impressed with Becky and her family, for taking care of the cats and helping other TNR programs too. We enjoyed Becky’s story. 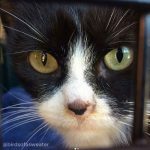 TNR is so important – she and her daughter are doing great work! Also the birds are very cute. Sure glad there are humans who care for feral cats! I love those birds-i am gonna check out her instagram page! Officer Tom seems like a real character! Great post! Thanks for caring for the kitties! What a great interview! And what a lot of work! We applaud Becky and her daughter for caring for so many who have been left to fend for themselves. BRAVO! Wow! Becky and her daughter are doing great things! Thank you to them for taking care of the colony and doing so much for animals. And thank you for introducing us to her. Those toys are cute. The striped bird toy is adorable! I enjoyed reading your story. Good luck with everything! Humans who care for colonies are just pawtastic. It is such hard work, and sometimes heartbreaking. We’re going to add her store to our Etsy favorites. We love supporting Etsy store owners. These are just super cute! I love them! Oh what a WONDERFUL thing Becky and her family are doin’. PURRS. Love hearing about people looking out the cats in the world. What a great cause! I love my kitties!! I absolutely love the birds thanks so much for the chance. I love to read stories of those who help where they can, how they can. It’s so inspiring and I’m so grateful for people like Becky and her family. My 2 kitties (one a shelter rescue and the other a dropped-off behind someone’s house at 8 wks rescue) also love what Becky is doing. I love the birds and my sons Mustang kittycat’s birthday is coming up…yes we will be having a party. These are adorable!! My grandkitty will love these! These are so cute, My cat has 1 bird toy and loves it! So I know she would love these too! My kitty would love these toys~thanks! My cat would be in heaven with these toys, thanks for the chance! Starr Cat would enjoy these toys! What a beautiful person! 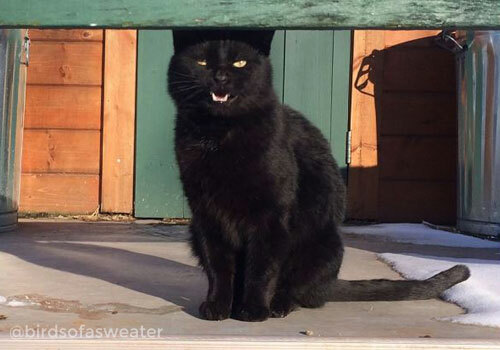 I love what you do and have often wondered what happens to all the cats that live in the cold. I live in So Cali and hate the thought of these poor cats being outside. You have a HUGE heart of Gold. 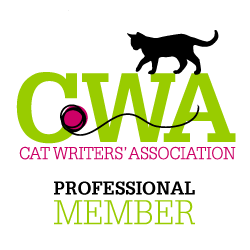 I will definitely get the word out regarding you and your cat toys; I will also head over to etsy and purchase some for my cats and the Shelter cats where I foster.